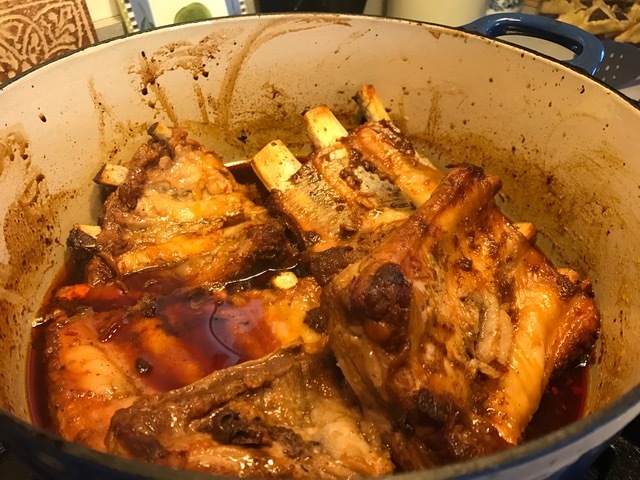 I’m woefully behind on posts for Cook the Book Fridays, so in addition to this week’s Caramel Pork Ribs, I’ll catch you up on two other recipes I made from David Lebovitz’s My Paris Kitchen. First the ribs… After a seemingly early spring thaw, winter came back with a vengeance bringing super cold temperatures and another load of snow. Ribs at our house are typically slow-cooked outside in a wood-fueled smoker, but not during the winter. When I checked out at the grocery store with my rack of spareribs, the cashier commented that only a devoted “super-griller” would be willing to stand outside that day and cook ribs. I was happy to respond that I’d be making ribs in the oven! These ribs cook in a savory caramel sauce that starts by melting sugar, a step that used to terrify me, but I am slowly becoming more comfortable with. The sauce is rounded out with some beer (I used stout) and bourbon along with other savory ingredients. The ribs, cut into 3- or 4-rib portions, are coated in the sauce and then baked in the pot for a couple of hours, turning occasionally. The pork became meltingly tender, practically falling of the bone. I opted to serve these “French-Style” with plain white rice, though when Howard read the open page of the cookbook, he wished I’d chosen the suggested Mashed Potatoes. Even though mashed potatoes probably would have been tasty, I thought the rice was the perfect platform for spooning some the sticky sauce. We both enjoyed the ribs. It’s exciting have new winter option to cook when the smoker is buried under a pile of snow. 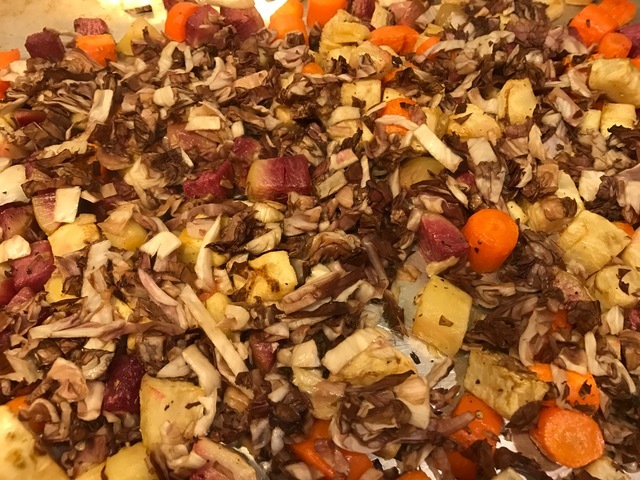 Two weeks ago, I made the Wheatberry Salad with Radicchio and Root Vegetables. We had just returned from a week in Florida, and though I made this dish on time, I couldn’t get it together to write about it. I love roasted root vegetables. Fall and winter, a steady supply of them fill the refrigerator and a “make shift” root cellar. I’m getting to the end of my stockpile, but I roasted a combination of watermelon radish, celery root, parsnips, and carrots, a colorful medley. Radicchio is something I’ve only eaten in salad, so throwing chopped radicchio on top of the root vegetables in the oven for a few minutes to wilt was a new trick. My salad was based on farro because I’m enamored with Trader Joe’s 10-Minute Farro. The farro is parboiled so it really does cook in just 10 minutes, though I forgot to add a bay leaf when I cooked it for this recipe. The farro and vegetables are tossed together with a dressing made tangy by the addition of pomegranate molasses. You’ll notice that I didn’t add the pomegranate seeds. Pomegranate seeds in this salad would have violated Howard’s rule prohibiting the mixing of fruit with savory. Also, pomegranates just went out of season here, so I couldn’t find any anyway. I served this salad as a side with roasted chicken thighs. Another hit that will be repeated. Finally, there’s the Merveilleux, on the schedule back in February. This was a dessert that just didn’t want to get made. 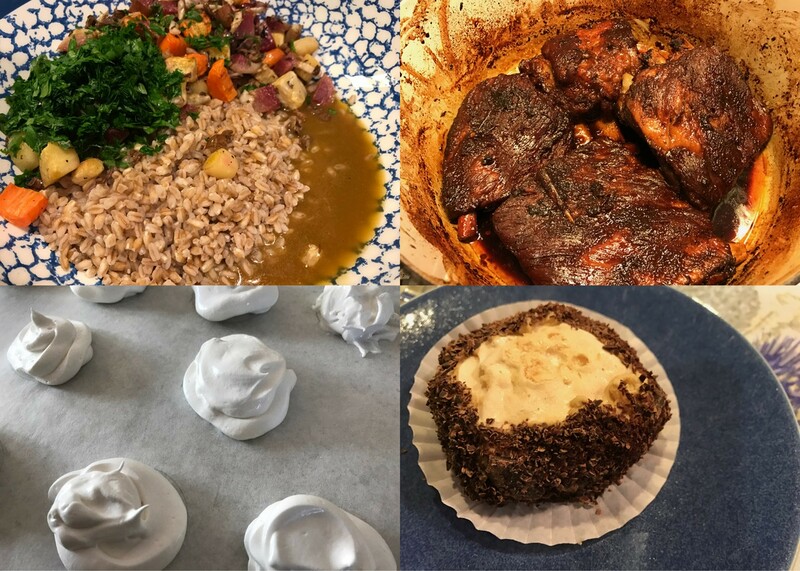 David Lebovitz challenges anyone who doesn’t like meringues because they’ve never tried a merveilleux. I like meringues. The problem is that I’m not a big fan of whipped cream. I really dragged my feet on this one. When I first set out to made these last month, I was out of confectioners’ sugar. Earlier this week, I restocked and made the meringues. When I got ready to make the whipped cream filling/coating, I found that the whipping cream was spoiled. Off to the store again. I whipped up the cream with a tinge of espresso powder, making it reminiscent of tiramisu. 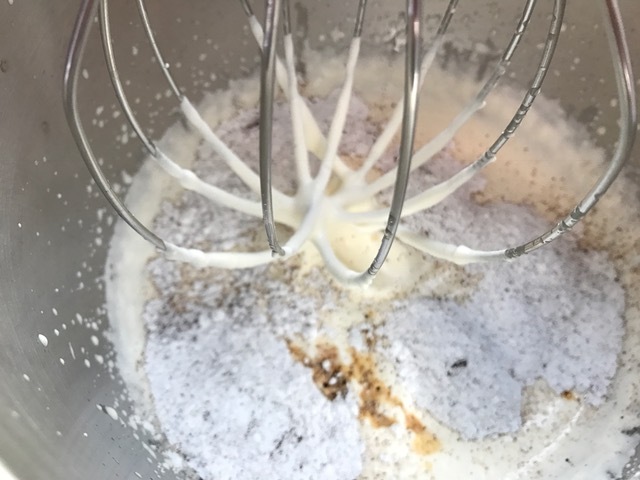 To construct the merveilleux, I sandwiched the cream filling between two meringues, slathered the outsides with more cream, and rolled them in chocolate, before chilling them for a couple of hours. This is one recipe where I wish the book had included a picture. I still have no idea what merveilleux are supposed to look like. Howard renamed these “Merv Griffins” because it’s easier to say. Neither of us were fans, obviously because we don’t care for whipped cream. I made a half batch of five, so hopefully I can find three friends to share the remainder with before they get soggy. If you don’t have My Paris Kitchen in your cookbook collection yet, you should add it. So many of these recipes are winners. If you want to try any of these recipes yourself, you can find Pork Caramel Ribs on page 187, the Wheatberry Salad on page 240, and Merveilleux on page 281. To see what my friends thought of these recipes, check out their posts from Cook the Book Fridays. Happy St. Patrick’s Day! Erin go bragh! I’ve really fallen down on the job as a blogger. I cook daily, delicious things, but so often I neglect to take photos and then it’s all gone, or I take photos, but don’t sit down to write about my latest favorite dish. I’m promising myself to get back to a more regular schedule of posts in the new year, or before. 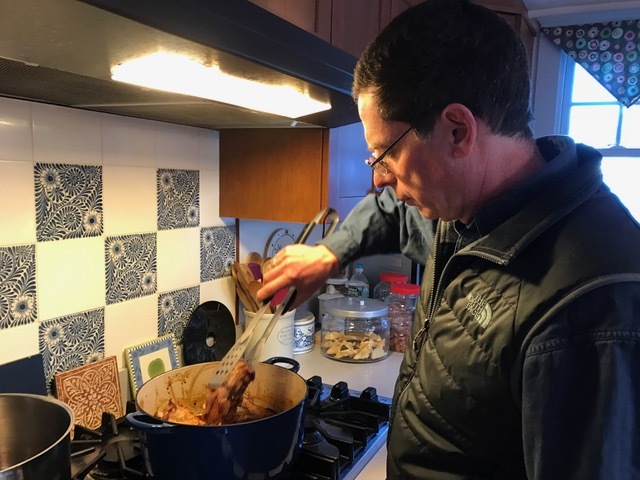 In the meantime, my participation in the Cottage Cooking Club provides an occasion for sharing my thoughts on a few new recipes I tried this month. 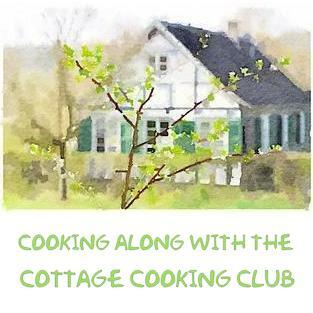 If you don’t already know, the Cottage Cooking Club is an on-line group of bloggers who, under the leadership of the lovely Andrea, The Kitchen Lioness, has been cooking recipes from Hugh Fearnley-Whittingstall’s River Cottage Veg. 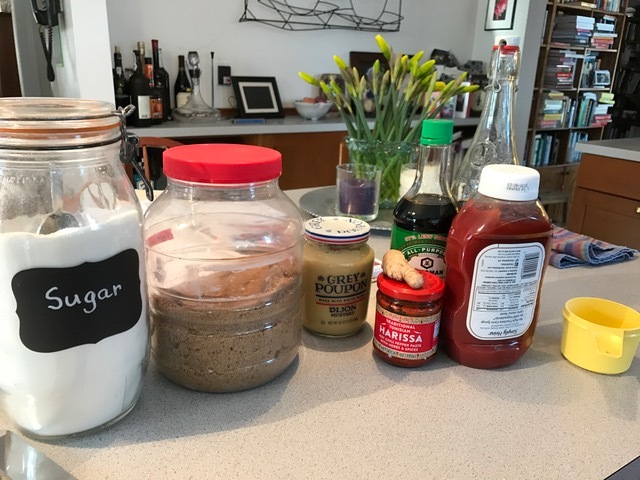 Each month, Andrea selects one recipe from each chapter, each participant chooses the ones she wants to try, and at the end of the month, we share our experiences. I usually pick the ones are the most appealing to my palette. It’s great fun to read everyone else’s posts, and based on their reviews, add additional recipes to the never-ending list of ones to try. Here are my thoughts on the recipes I chose, in the order I prepared them. First up, I made the Roasted Potatoes with Two Mojo Sauces. 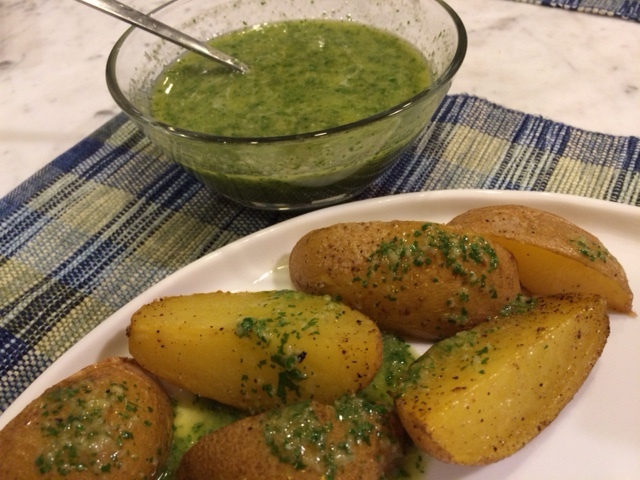 I actually roasted potatoes on two separate occasions and each time served the potatoes with a different mojo sauce. Roasting potatoes is a straightforward thing, but these instructions resulted in a crispier exterior than I usually get, so I was delighted to have a new trick up my sleeve. I made a half batch of each sauce because I could tell each made a large quantity. We enjoyed both the red and the green sauce which had a (American) Southwest flavor profile – a bit surprising from a British cookbook. The sauces went well with the potatoes and also on top of simply roasted chicken. (Can I say that when this book is supposed to be about the vegetables?) This was my favorite of this month’s recipes. Next, I made the Kale Speltotto, though it would be more accurate to say I made Kale Farrotto. This recipe is similar to risotto, using spelt (or in my case, farro) instead of Arborio rice. Hot broth is gradually added to the grain, letting it absorb completely between batches. I made a squash stock from seeds I’d scooped from a winter squash earlier in the week. As for the grain, I had whole-grain spelt in the pantry, but was worried that, because it wasn’t pearled, it wouldn’t cook in time for dinner. I couldn’t find any pearled spelt at the store. 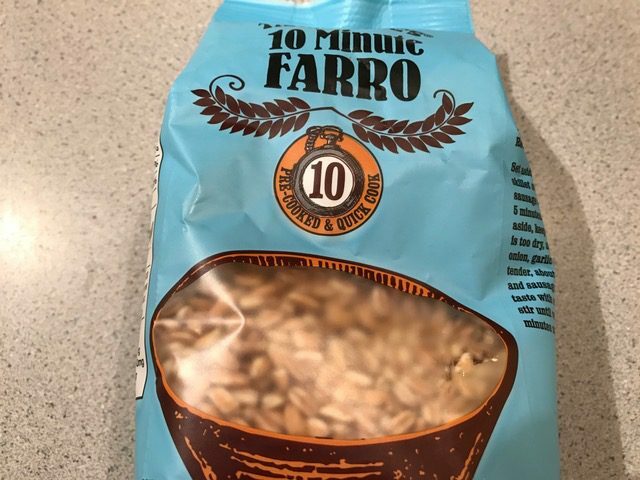 After reading the package of the brand of farro I had at home, it seemed like its cooking time would work. 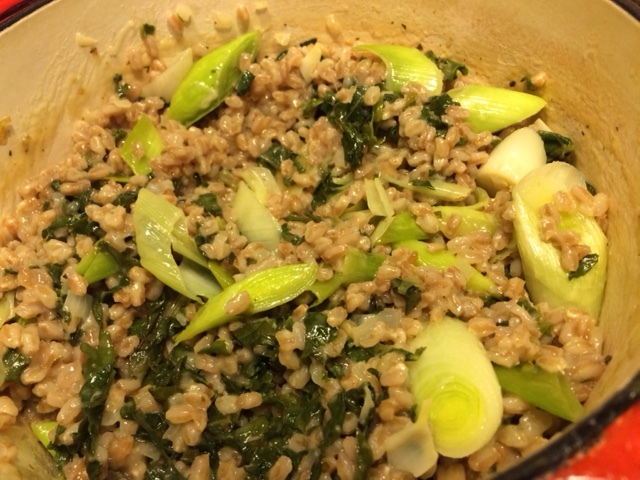 Of course, when I got home, I found that I didn’t have nearly enough farro OR pearl barley on-hand. I did have plenty of parboiled farro, which typically cooks up in 10 minutes. I wasn’t sure how it would work out, but it was a success. It took longer than 10 minutes to cook, but was done when pearled spelt would have been. I used kale I had picked myself after a volunteer shift at the farm. The combination of kale and leek was delicious. I was also out of goat cheese (normally a staple), so I topped this with grated Parmesan. Lesson learned: Take a better inventory of what you have before deciding what to make for dinner, though if you misjudge, it almost always works out with whatever you have. 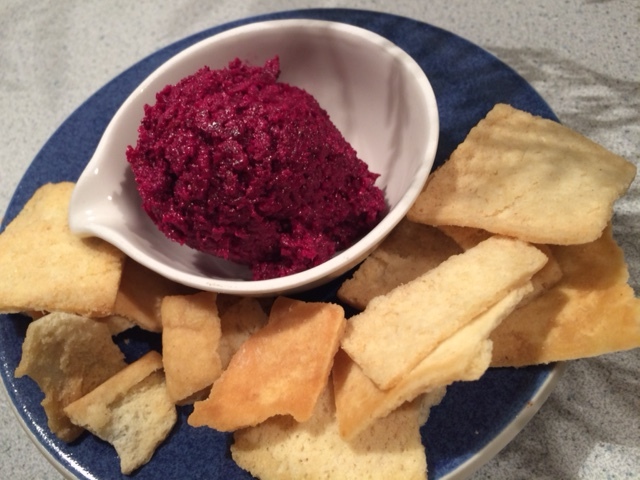 The final recipe I prepared from this month’s choices was the Beet and Walnut Hummus. I love beets. Beet-Walnut Salad is one of my favorite ways to eat roasted beets. This dip had similar ingredients, but the final result wasn’t a favorite. The beets overpowered all the other flavors except the cumin. And it was extremely sweet – too sweet for our taste buds. The sesame flavor of the tahini didn’t stand out at all. We prefer either the creamy texture of hummus made with chickpeas or the chunkier texture of my usual beet salad. In addition, I finally made the Twice-Baked Potatoes the group made last November. They were fabulous. My mother used to make a simpler version of this, simply scooping out the potatoes, mashing the innards, refilling the potato shells, and generously sprinkling the top with paprika before rebaking. Hugh’s version is much more decadent. The filling is like a loaded baked potato, mixed with sour cream and cheddar cheese and studded with scallions. This is a vegetarian cookbook, but crumbled bacon would be at home in the filling. These are a new favorite, and they were perfect to serve to company! Our Thanksgiving table wouldn’t be complete without roasted Brussels sprouts. One of my favorite ways to prepare them is Hugh’s Roasted Brussels Sprouts with Shallots. Since the group first made this last October, I frequently revisit this recipe, and I baked a batch to bring to the Thanksgiving feast we attended with friends. I hope all of my American Cottage Cooking Club friends had a wonderful Thanksgiving holiday, sharing good food and company with family and friends. I look forward to catching up with all of you again in December. 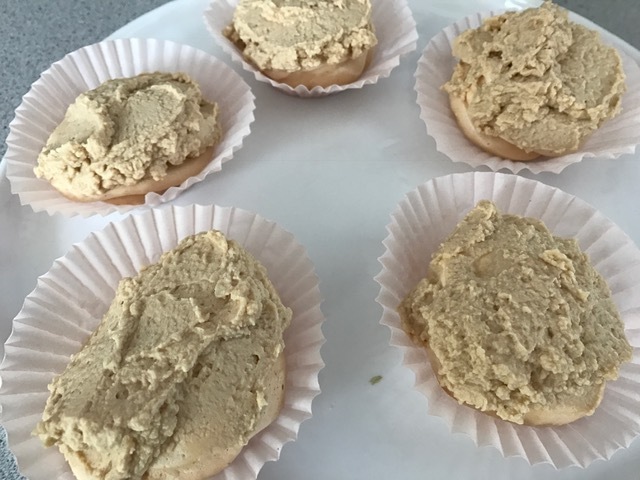 To find out what the other Cottage Cooking Club bloggers thought of their selections this month, follow their links here.